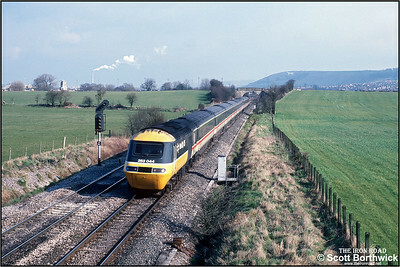 43169/43141 accelerate away from Westbury at Fairwood on 25/02/1988 with the 1215 London Paddington-Plymouth service. 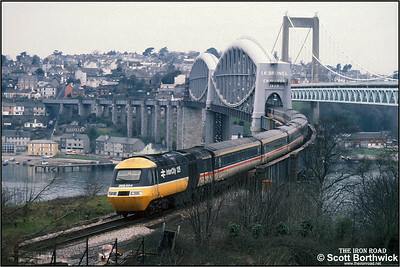 43008 crosses the River Tamar by means of Isambard Kingdom Brunels magnificent bridge and enters Devon during March 1988 with the 0828 Penzance-London Paddington service. 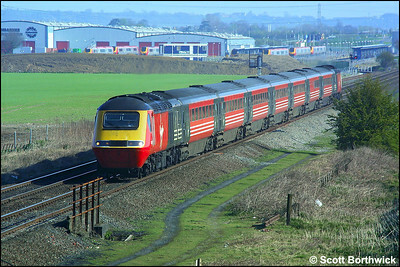 43067 leads an unidentified Virgin Cross Country service south at Homedown LC, Ashchurch during February 2001. 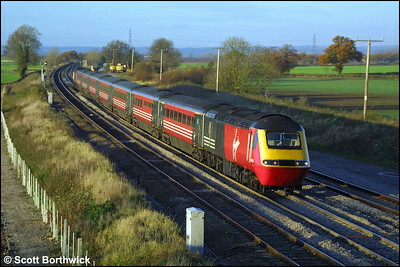 An unidentified Virgin HST passes Portway on 19/11/2001 with a southbound Cross Country service. 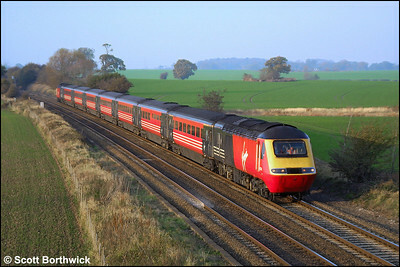 43089 passes Elford on 19/11/2001 with a southbound Cross Country service. 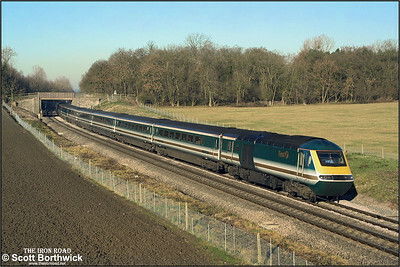 43129/43151 pass Besford whilst forming 1L58 1208 Worcester Shrub Hill-London Paddington on 05/12/2001. 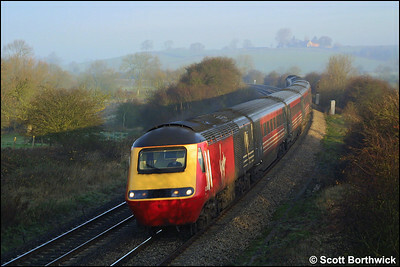 An unidentified Virgin HST speeds through the early morning mist at Holmes House Farm, Bishops Itchington with a southbound Cross Country service on 06/12/2001. 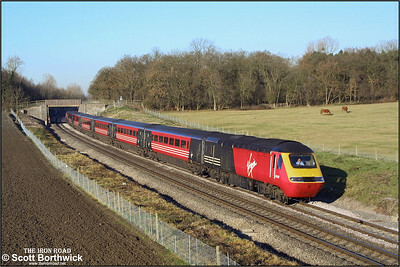 43179/43150 pass Besford whilst forming 1L58 1208 Worcester Shrub Hill-London Paddington on 12/12/2001. 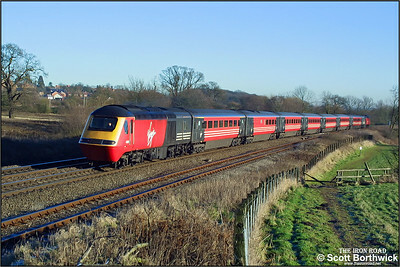 43097/43198 provide the power for 1V47 0710 Edinburgh Waverley-Plymouth passing Besford on 12/12/2001. 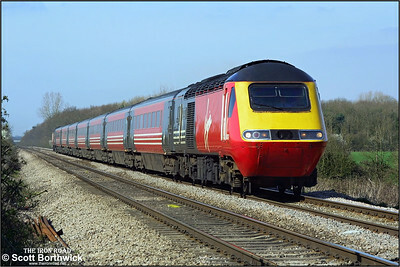 43196 'The Newspaper Society, Founded 1836' & 43078 climb Hatton bank whilst working 1E32 0905 Poole-Newcastle on 31/12/2001. 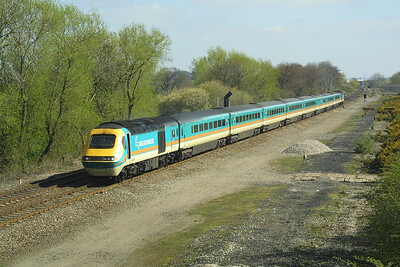 The train was diverted via Solihull to avoid congestion in the Coventry area as the OHLE was down between Coventry & Rugby. 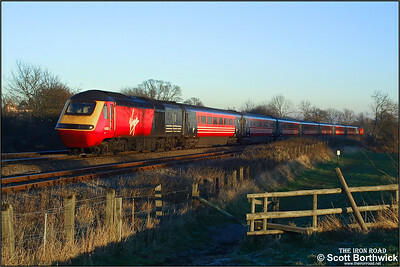 43155 'City of Aberdeen' and 43193 'Plymouth, City of Discovery' form a diverted Virgin Cross Country service up Hatton bank on 31/12/2001. 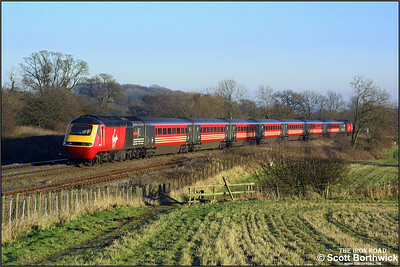 43158 'Dartmoor, The Pony Express' and 43071 form a diverted service climbing Hatton bank on 31/12/2001. 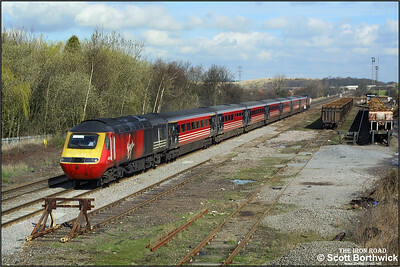 43079/43091 race past Kingsbury Sdgs whilst forming 1V46 0740 York-Swansea on 19/03/2002. 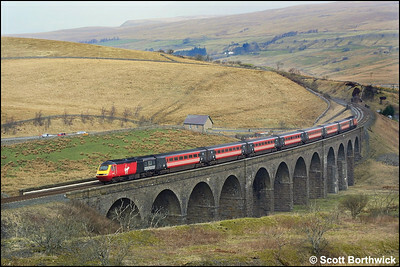 43092/43104 cross Dandry Mire Viaduct whilst working 1V52 0910 Edinburgh Waverley-Penzance on 23/03/2002. 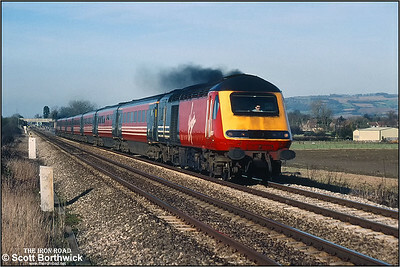 43123/43071 pass Claydon (Gloucestershire) whilst working 1V47 0710 Edinburgh Waverley-Plymouth on 26/03/2002. 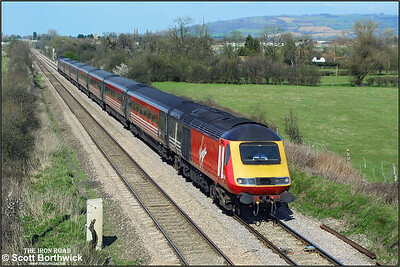 43197 'The Railway Magazine'/43156 speed 1V49 0640 Dundee-Penzance 'The Cornishman' past Pirton Crossing, Worcestershire on 26/03/2002. 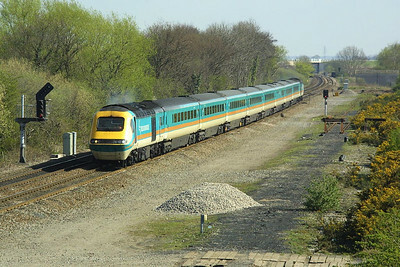 43097/43086 are pictured at Catholme, to the south of Burton upon Trent, whilst working 1V41 0645 Newcastle-Plymouth on 06/04/2002. 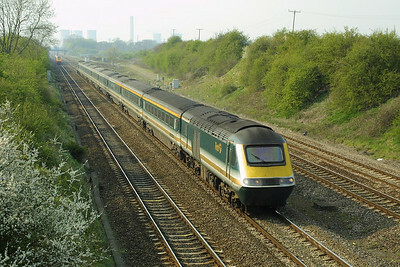 In the background the newly constructed Virgin Voyager depot 'Central Rivers' can be seen. 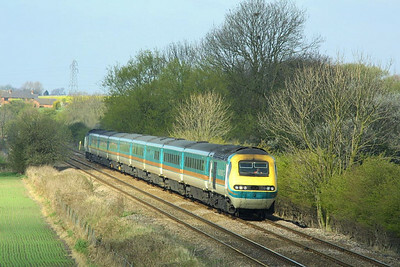 The voyagers visible were all awaiting commissioning and entry to traffic. 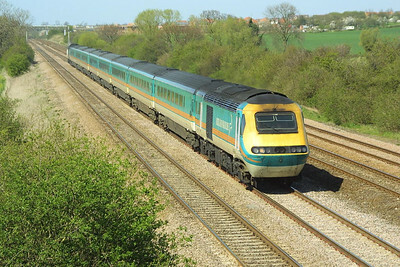 This view is no longer possible due to the construction of a huge warehouse building for Argos. 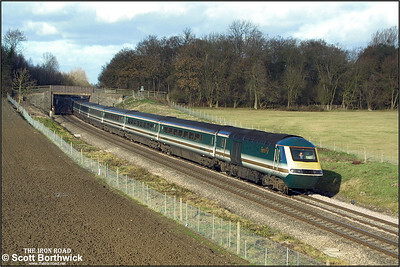 47839 enters South Moreton Cutting, south of Didcot with 1O38 0910 Edinburgh Waverley-Bournemouth on 10/04/2002. 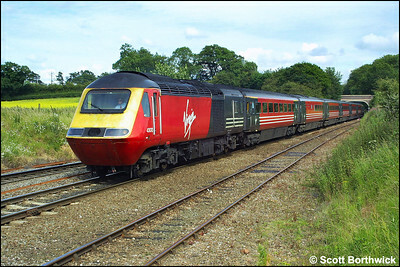 43070, with 43078 out of shot on the rear, approaches Whitacre Jnct with a diverted Virgin Cross Country service on 07/07/2002. 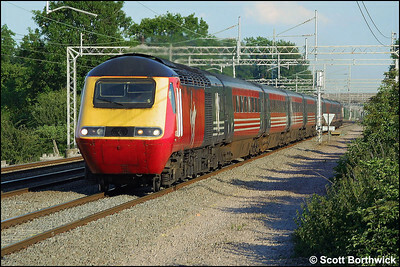 An unidentified Virgin HST speeds northwards at Cathiron on 13/07/2002.